Researchers at Massachusetts Institute of Technology (MIT) have created an amazingly tiny wireless device that fits on your index finger. Called NailO, it lets you swipe your smart phone trackpad instead of push on it. A simple and elegant concept, they believe it can be used in a number of different situations. 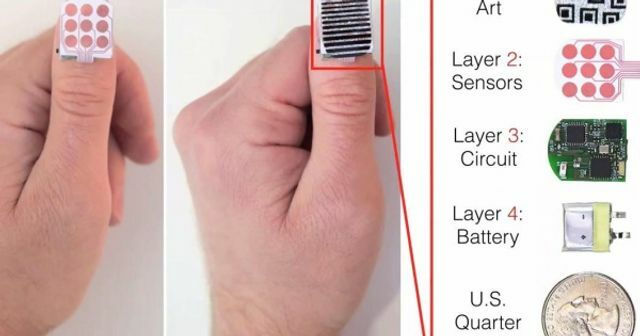 For example, they say that this wearable sensor could let users control wireless devices when their hands are full, like when they are cooking and need to answer the phone. It could also be a very unobtrusive way of working on your phone during meetings and conferences without attracting attention. The researchers have also been in discussion with battery manufacturers. They have traveled to China to meet with several of them, and have identified a technology that they think could yield a battery that fits in the space of a thumbnail, but is only half a millimeter thick. Creating this gadget was no easy feat – the researchers needed to find a way to pack capacitive sensors, a battery, and three separate chips — a microcontroller, a Bluetooth radio chip, and a capacitive-sensing chip — into a space no larger than a thumbnail. Of course, it can be personalized too. “From the fashion-conscious, to techies, and anyone in between, NailO can make a style, art, or a design statement,” the team behind the trackpad says on its website.